Chef-owner Omar Giner draws equally upon his heritage and professional training to produce some of the most authentic, as well as some of the most creative, interpretations of Cuban cuisine anywhere. 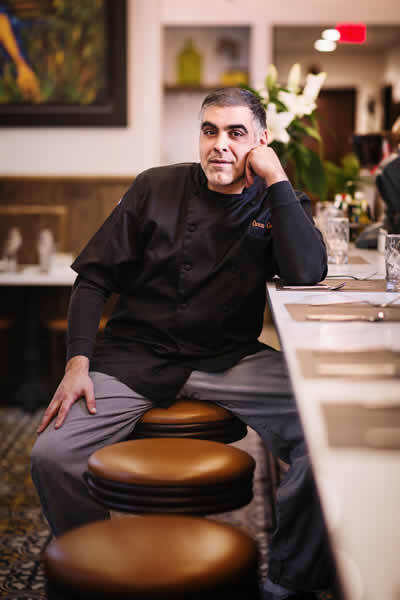 With the technical knowledge of a professionally trained chef and a lifetime of Cuban home cooking, his cuisine straddles the gap between the many neighborhood Spanish restaurants that litter the inner cities of northern New Jersey and the chic Nuevo Latino restaurants that are some of the hottest in New York City. His traditional dishes depend on uncompromising fresh genuine ingredients to capture the simple and hearty essence of Cuban cooking. His liberal Nuevo Latino specials make use of the amazing array of ingredients that comprise Latin American cooking to create colorful dishes with the contrasting flavors and textures that has made this cuisine so popular in recent years. Originally a pastry chef, Omar’s desserts are some of his most popular and creative dishes. Omar has garnered many accolades from the food press and has appeared on several food shows. Among his many fans are some of the most famous Latin personalities from the entertainment and political world, as well as the most demanding Cuban house wives looking for taste of home cooking without the dirty dishes.